Several years ago I was prepping for a Kentucky Derby party and I was trying to write the menu on a large chalk board as beautifully as I’d seen in pictures. I was failing miserably. After a few freehand and stencil attempts I was about to give up when I realized I could print what I wanted on paper, in any font, and then trace & transfer it to my chalk board! Genius! 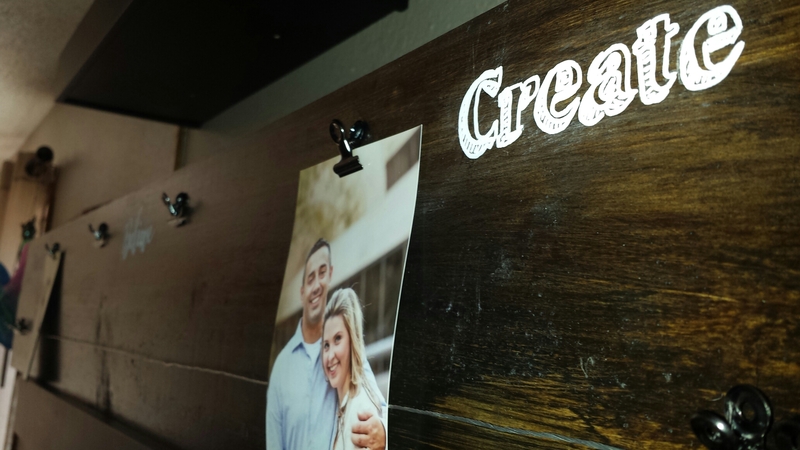 I’m going to reference the DIY Wood Picture Display I just completed. You can find that by clicking here. 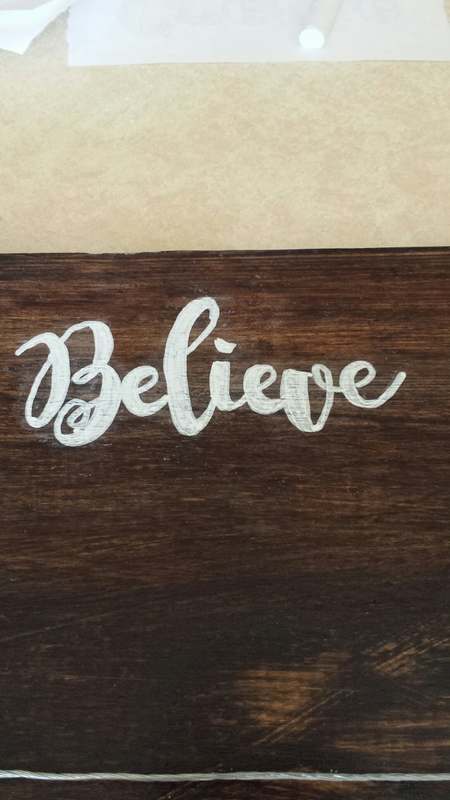 I wanted to add “Dream, Believe, Create ” to my wood board. Then I generously trimmed around my words. 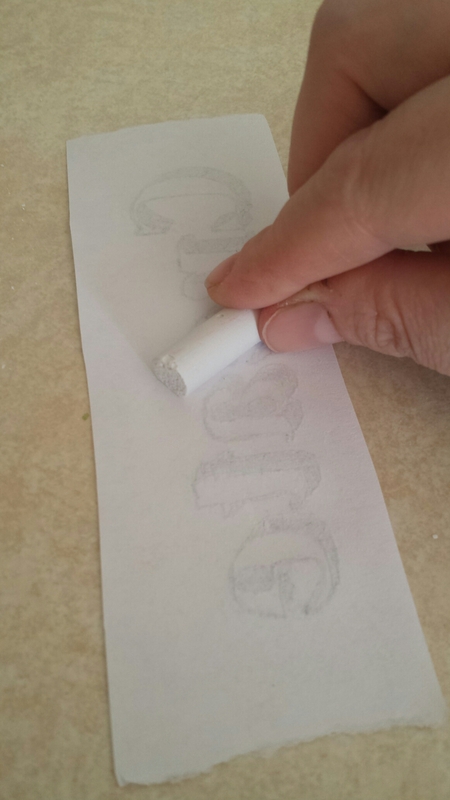 Next, take your basic chalk and rub a good coating on the back of the paper. 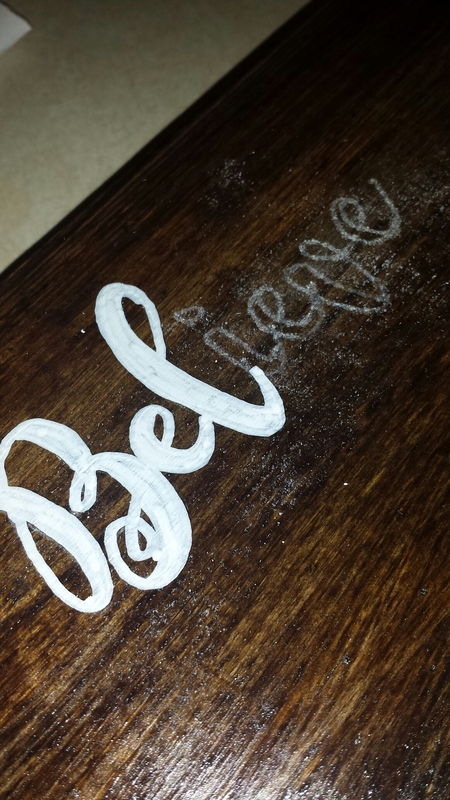 The chalked side will go down on your surface and as you trace the letters it will leave the design in a light chalk outline. You’ll want to press firmly depending, of course, on what you’re working with and take your time. The more patient and detailed the better the outcome. It’s worth it! 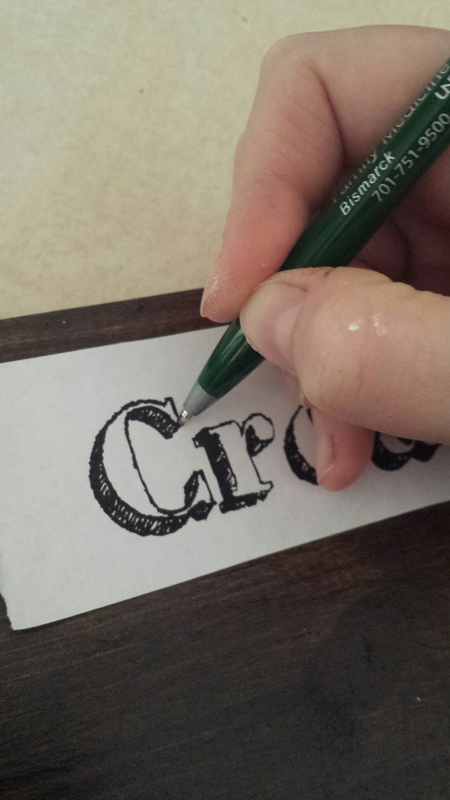 Once your tracing is done, carefully lift the paper off. 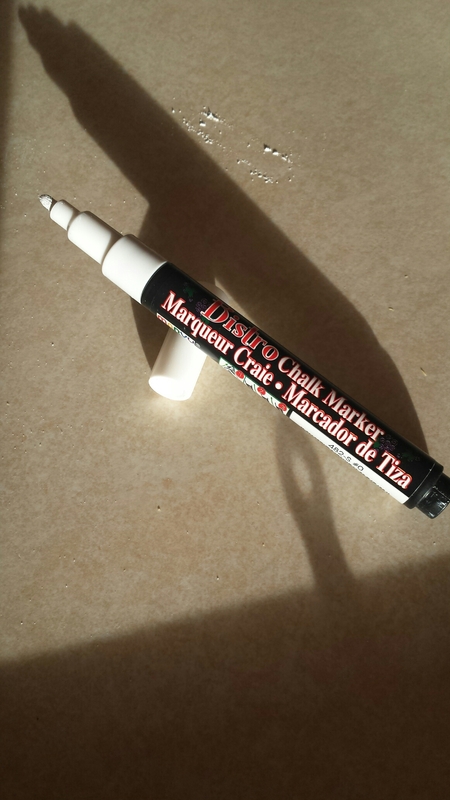 Then take your chalk marker and trace or fill in your outline. Voila! Here is the chalkboard of stats I made for my daughters birthday using this same method. I just printed out several stats in different fonts and banners. I laid it all out and then went word by word adding it to the board. 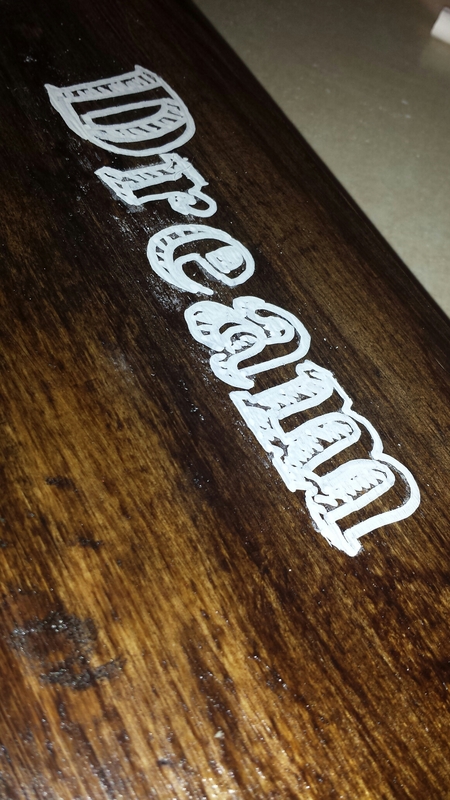 You might also like the Laundry Room Decor I also made using my chalk technique. In our first home as newlyweds we had big blank walls and little money to buy art. I decided I could make my own and the hobby (addiction) started.I love art. Almost all the decor in my home is something I’ve made, painted, or photographed. 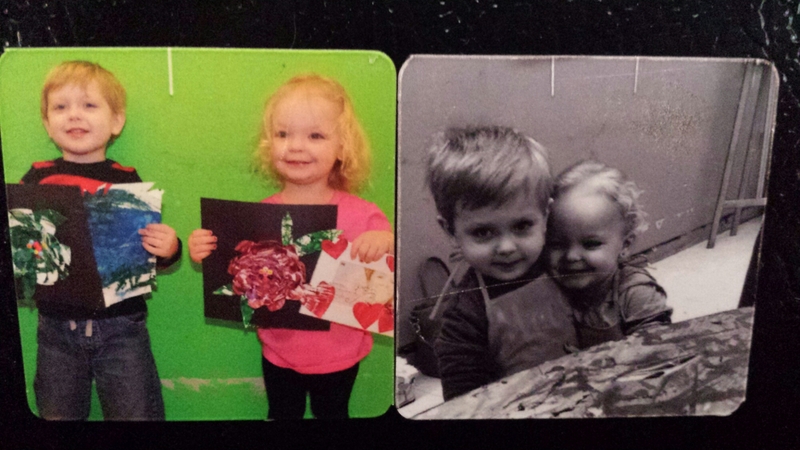 Since my son, Danny, was less than a year old we’ve been doing crafts and art together. Painted footprint “ghosts” and hand print flowers have been taped to our walls and cabinets. We moved to Bismarck and started going to a weekly art class with our friends. Danny would bring home lots of projects and paintings every week. 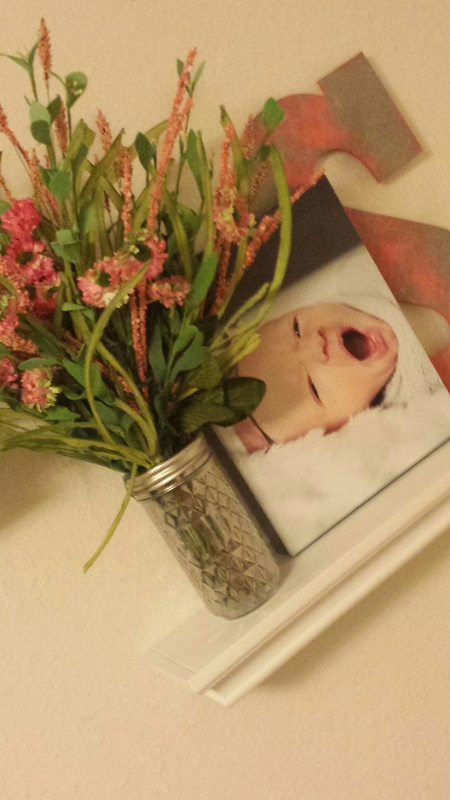 I wanted a nicer way to display them and something that we could change them out as he brought them home. Also, a way to easily change out photos would be great too! 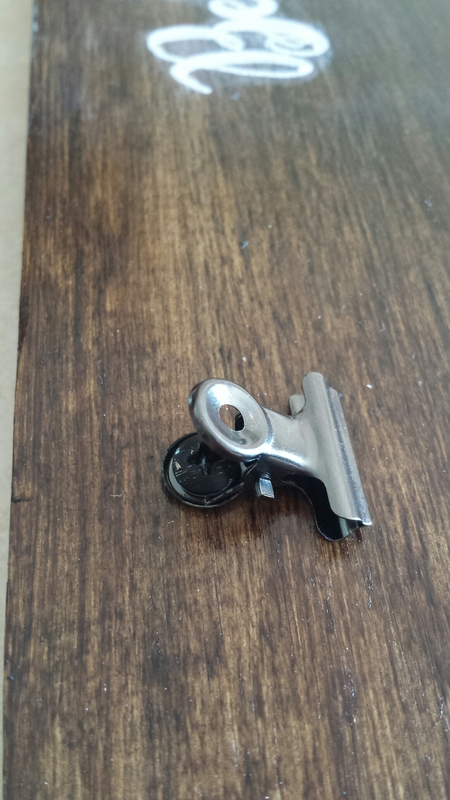 I had seen wood and wire/clips displays all over Pinterest. I thought that it would be far outside my crafting ability. But I was determined to make one of my own. Honestly, I figured I could just wing it other than follow a tutorial. But there are so many inspirations out there like this one from Heels in the Mud. 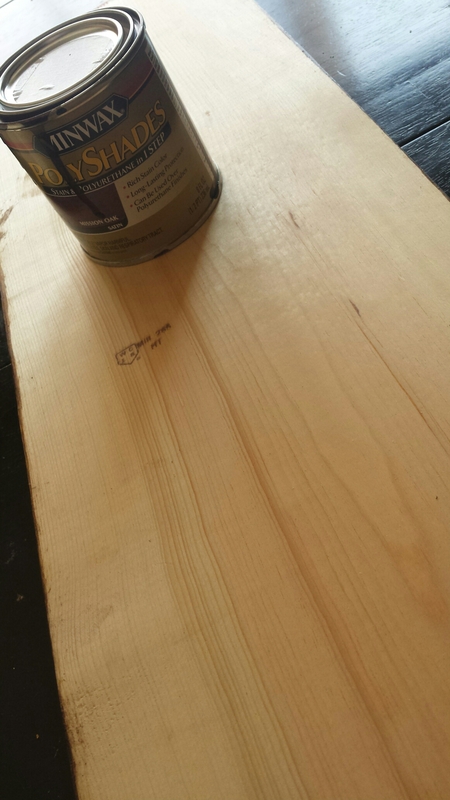 I had a couple of wood based projects I wanted to do so I headed to Lowes, kids in tow, to get the supplies. I selected a basic 6ft wood plank and a very nice man cut it into two pieces for me, a 4 ft and 2 ft. Minwax Polyshades Stain in Mission Oak is what I settled on for a base color. 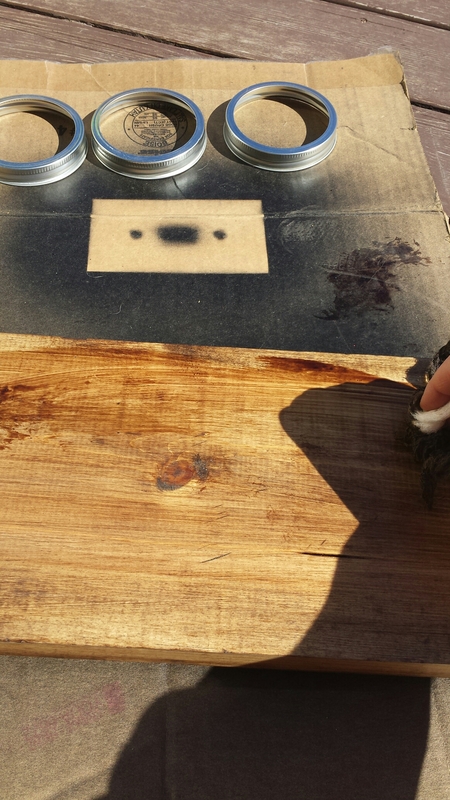 I have zero experience with staining wood, but I thought, how hard could it be? 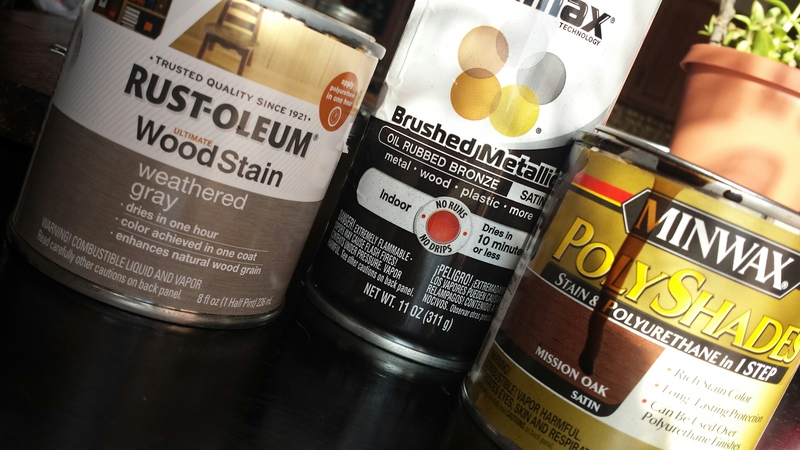 I ran by Hobby Lobby and got the metal clips, and also another stain, Rust-Oleum Wood Stain in Weathered Gray in hopes of making a master mix of color. 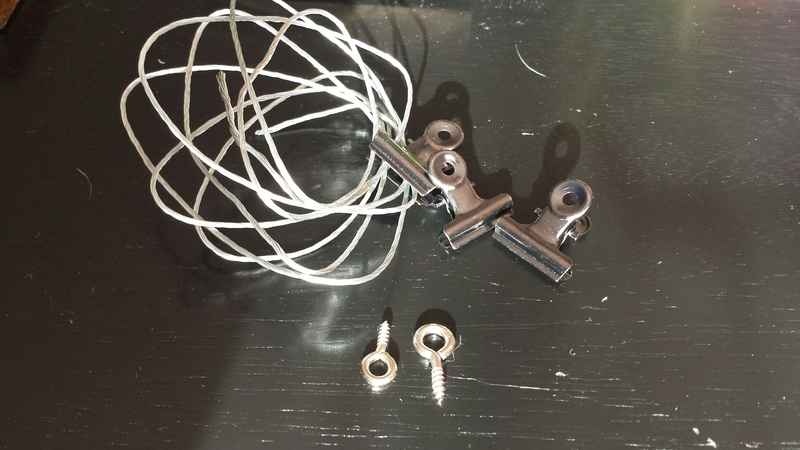 I already had my oil rubbed bronze spray paint from my prior Light Switch project, and wire and hooks from a large picture hanging kit we bought years ago. 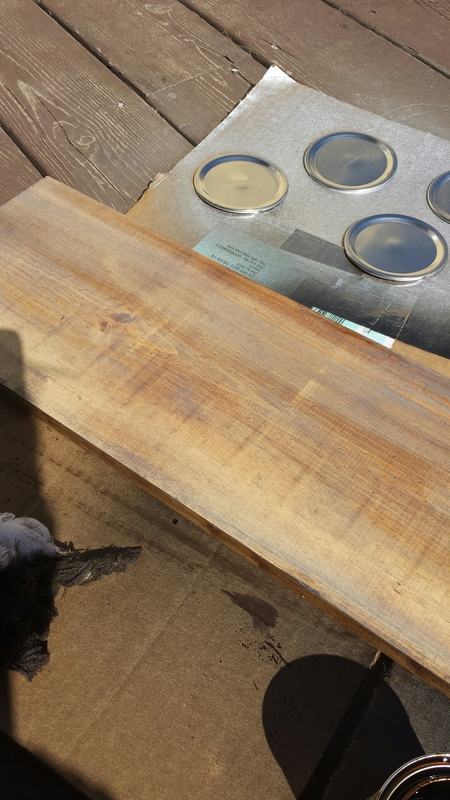 I started with the Mission Oak stain and, using cheesecloth (also purchased at Lowes), applied it to the wood pieces. 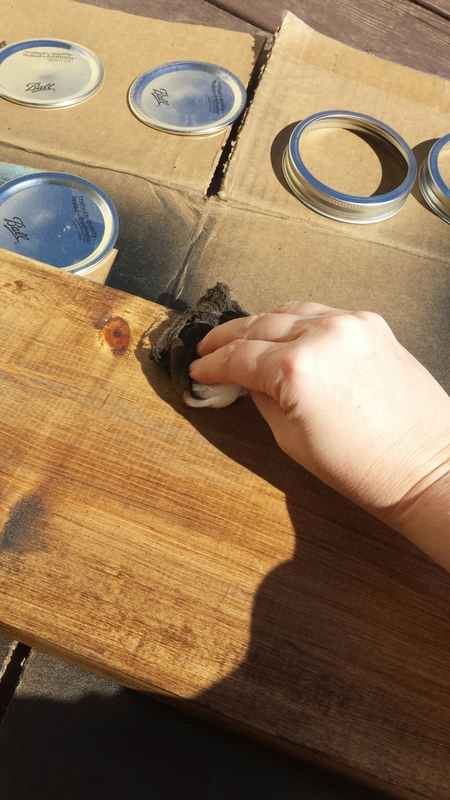 You want to keep everything moving in long strokes to keep the stain smooth and not blotchy. I let it dry a bit and then used the same process with a new piece of cheesecloth and a little of the Weathered Gray stain. I tried to just keep blending the colors letting some peek through more than others in different places. 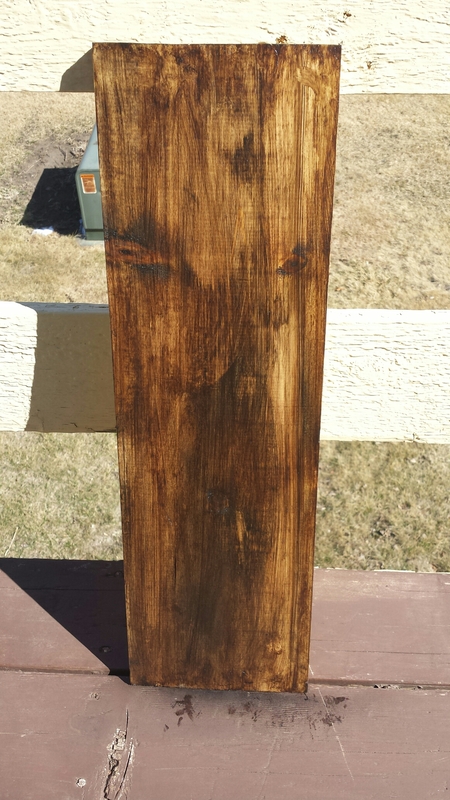 I wanted my plank to have a little bit of a charred look so it would match the black and oil rubbed bronze accents in our home. 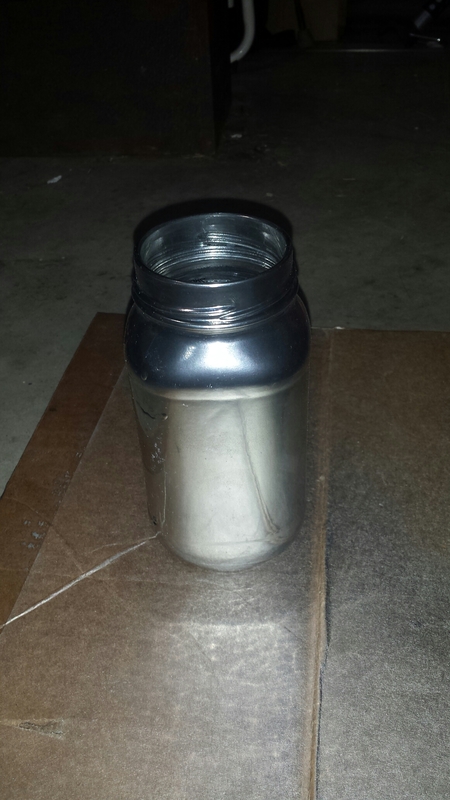 So I lightly sprayed my spray paint through out my staining process. Once I was happy with the color, and it was dry, I brought it in to attach the brackets. I measured everything out and set it out to see that it looked good before screwing it in. 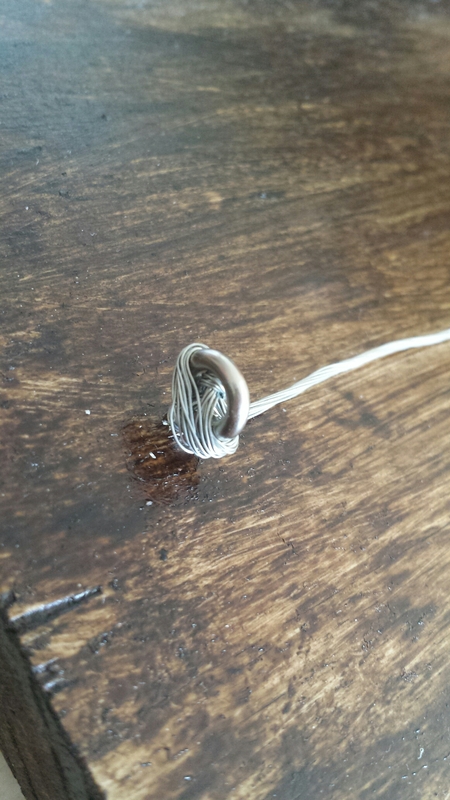 I attached the loops, just push and twist, then attached one end with wire, twisting like a twist tie then around the loop, then pulled the wire taut and did the same to the other side. I wanted space to hang pictures, 4×6 prints, at the top, so I spaced my clips about 9.5″ apart and secured them with screws. 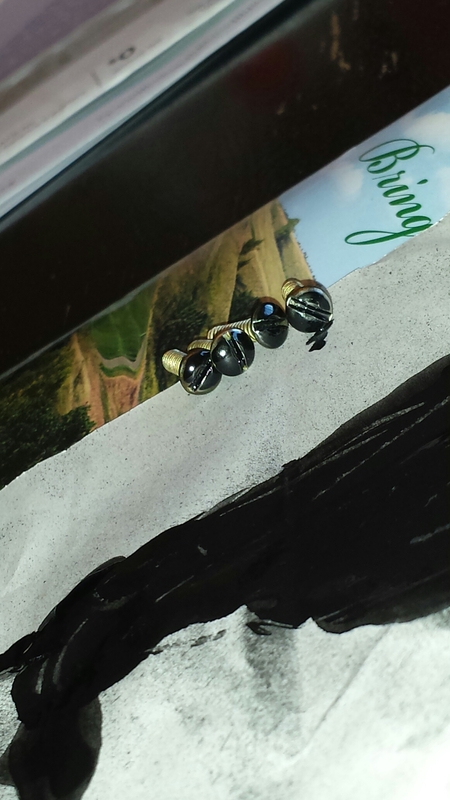 Then I painted the screw heads to match with acrylic black paint. 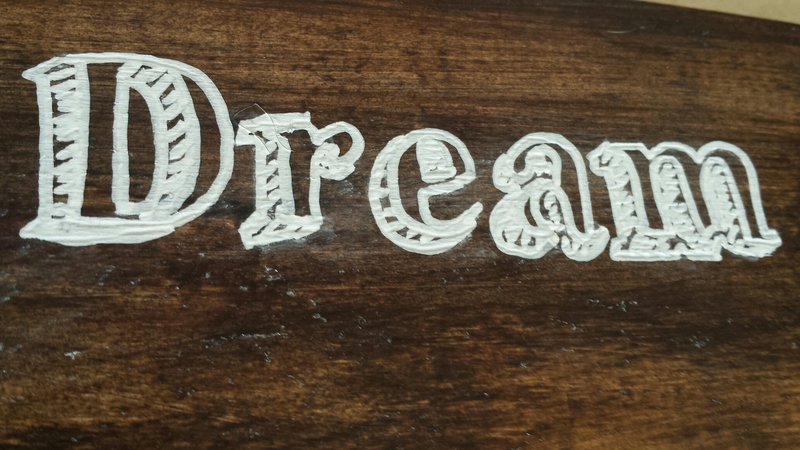 My board still needed a little something so I added, “Dream, Believe, Create” in chalk marker. 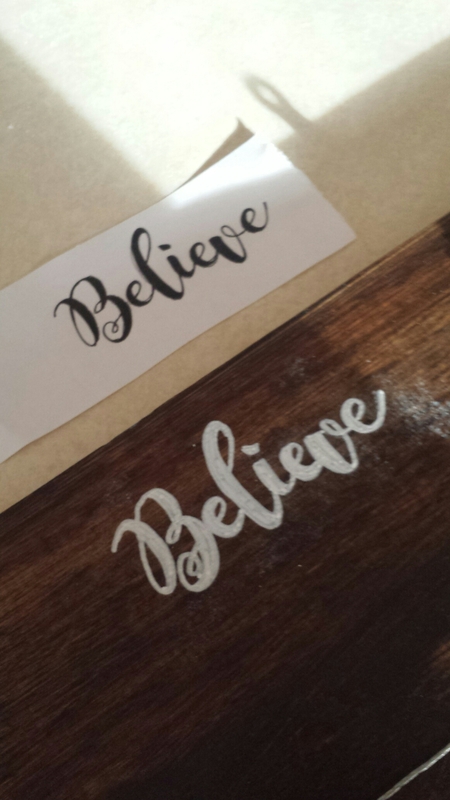 A tutorial on how to make chalk marker words & art is coming. Just add sawtooth hangers to the back and hang! I love the finished product. Making this sparked more ideas so stay tuned for those too! We had this fun construction party to celebrate my son’s 3rd birthday! This was easy to put together and we had fun naming all of our foods! Below you will find all the links to the pins I found from how to make your own “Under Construction” cake to free printable invitations and more! Lets start with the invite. 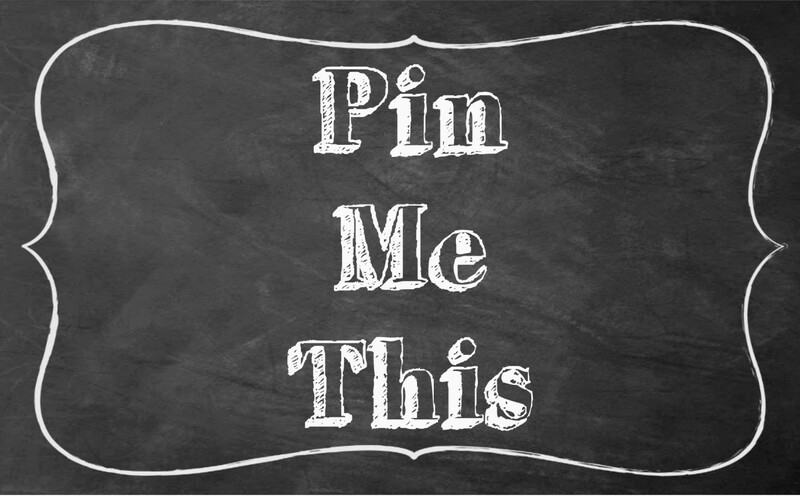 I found a slew of free printables at How to Nest for Less. I saved the picture then uploaded it to my favorite site, PicMonkey for editing. I had fun adding all of our info with different fonts, a few I was able to download for free. Just google what you’re looking for. You can do the same addition of fonts on the food tent cards, I ran out of time for this, and for any additional decor! There were so many cute things! Next my focus was on the cake. I wanted to make my own construction cake. I followed the directions from Two It Yourself. The banner I got at a party supply store and the construction cars we got at Target and they come in a set of 6! The candle was a regular, ugly store bought number that I colored to match. 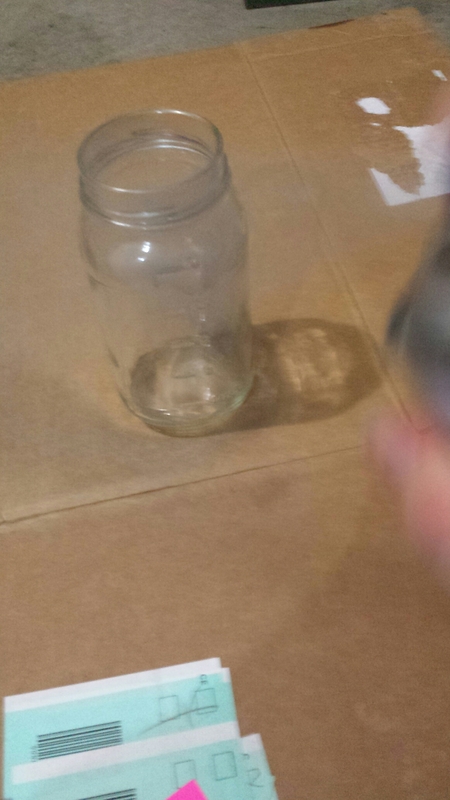 I got the idea last year for my son’s glitter candle I made by following this instruction. We highly recommend a construction party for your little guy or gal! The possibilities are endless! I didn’t use them but these cupcake toppers and invites from Forever Your Prints on Etsy are amazing! Plus, If you needed extra time, let someone else do the work! I’m a mom on the go and usually have it together…ok, sometimes have it together. But even when it’s a leggings and top knot kind of day, as long as I have a swipe of light color on my lips I feel like I have it together. Lipstick is a no for me right now, so is lipgloss, unless I have nothing else. 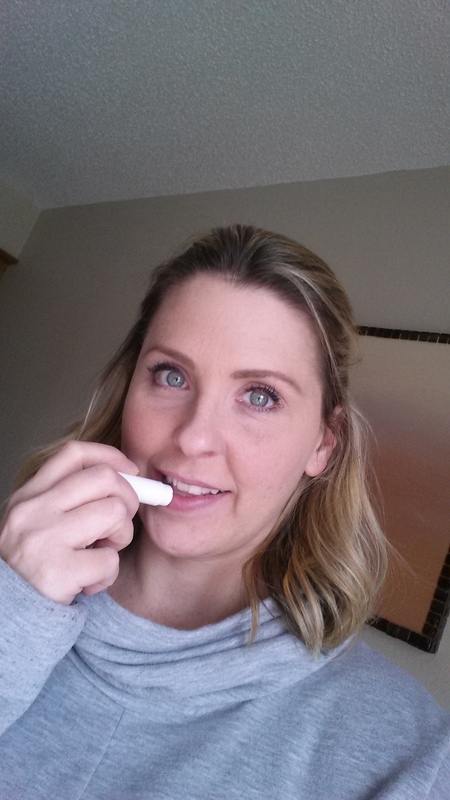 My usual everyday is my favorite tinted balm in a bright yellow tube! But my BUZZ worthy brand is quite pricy for such a small tube. I was beyond excited when I saw this pin from Dollar Store Crafts! 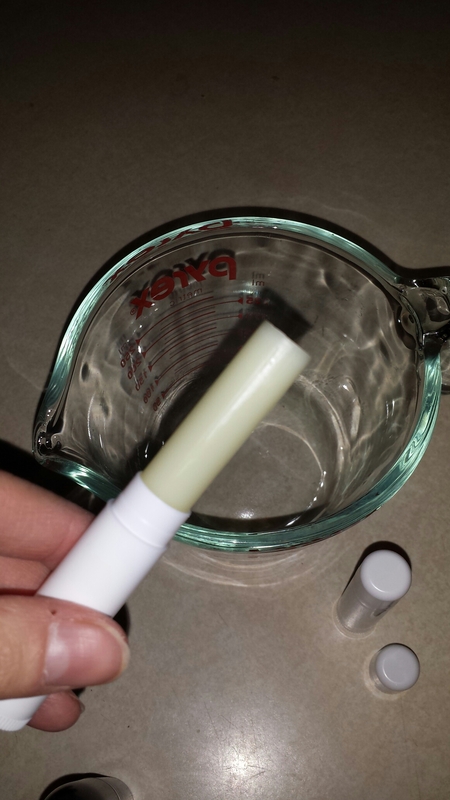 Make your own tinted lip balm?!?!? I couldn’t wait. Additionally great was that it took about 10 minutes to complete this. From gathering everything to application to my lips! 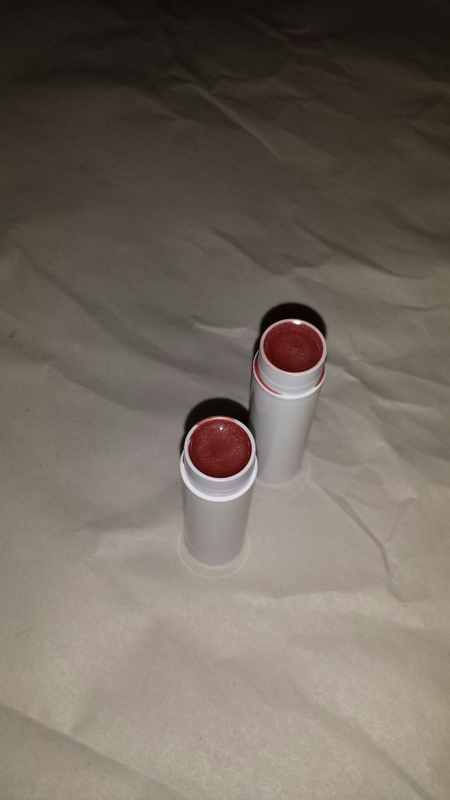 I searched through my bag of make-up I never have time for and found an old tube of MAC lipstick. It was a neutral, but it was quite a bit darker so I thought it would be a good blend. 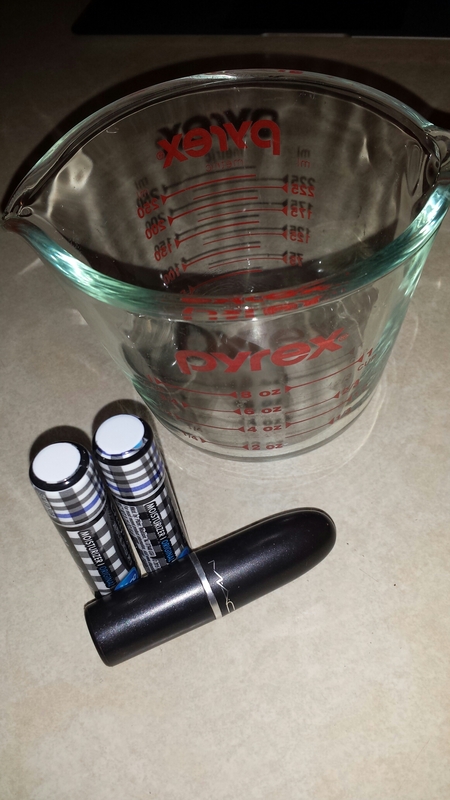 Then you push the chapstick all the way up and out into the microwaveable dish. I just used my fingers to pull it out. 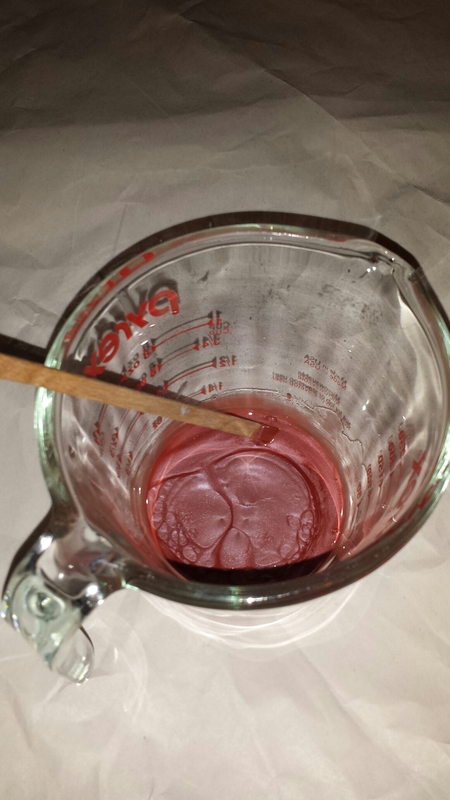 Do this with both tubes (if using 2) and then roll the base back to the bottom so they are ready to pour the mix back in. Then add your lipstick choice. The more you add the more color. *NOTE* I thought that my color choice was going to be darker than it turned out to be. 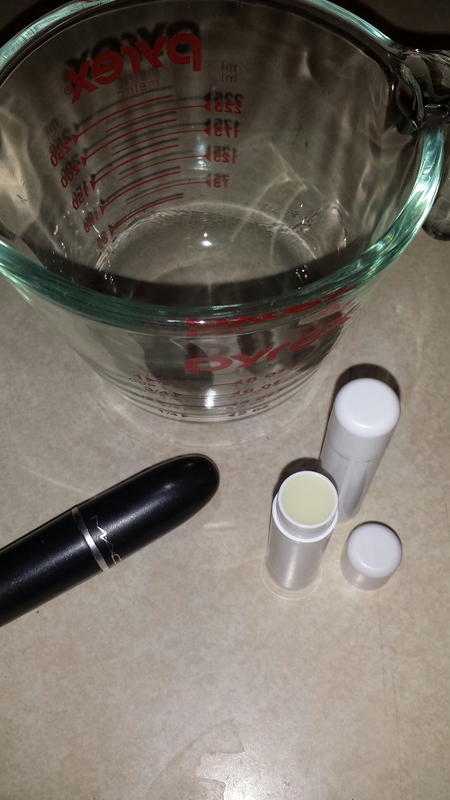 You really have to go into a more concentrated color if you really want a more tinted balm. You can always remelt the mix and add more color as needed, but knowing this first, I probably would have chosen a better color. Nuke your mix in 30 second bursts, stirring in between. 30 than 15 was about all that mine needed. 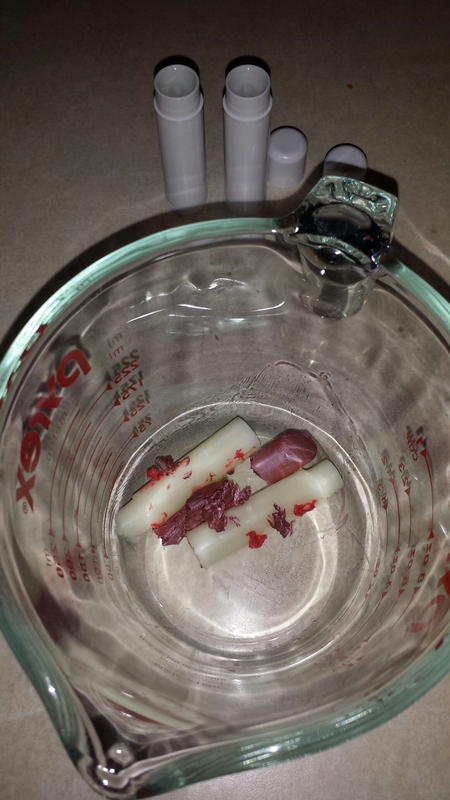 Stir it up a bit then pour it into your original tubes. Let it sit to cool and harden then swipe on and enjoy! 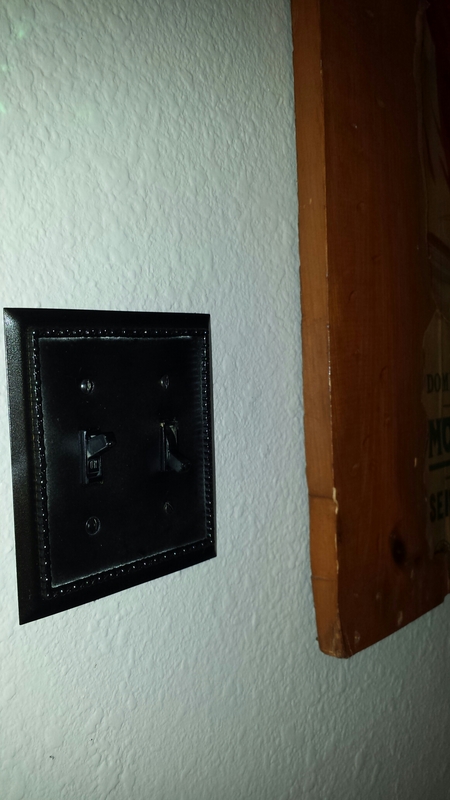 After 2 years of looking at the ugly, mismatched light switch plates in my kitchen, I decided to do something about it. We are in a rental, but have very cool landlords that let us upgrade as we like. Of course they would, right? ! We’ve only done a few things to the house to help make our lives easier and now I’ve added this, if only for my own sanity. The best part is the only thing to buy is spray paint, if you don’t have it already, like I do. 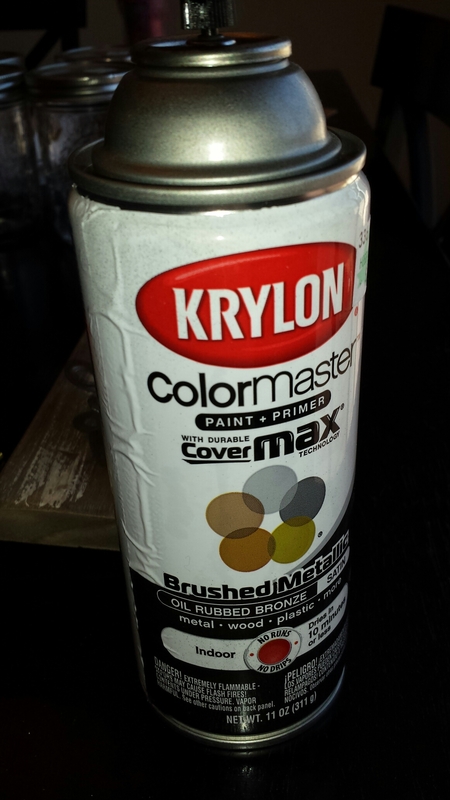 I chose Krylon’s oil rubbed bronze to match my kitchen, but let’s be honest, the possibilities are endless with spray paint. I’ve also seem some great switch plates covered in glitter that I’d love to do for my daughter’s room! Luckily, we had a nice, sunny, almost warm day here in ND, a rarity in March! 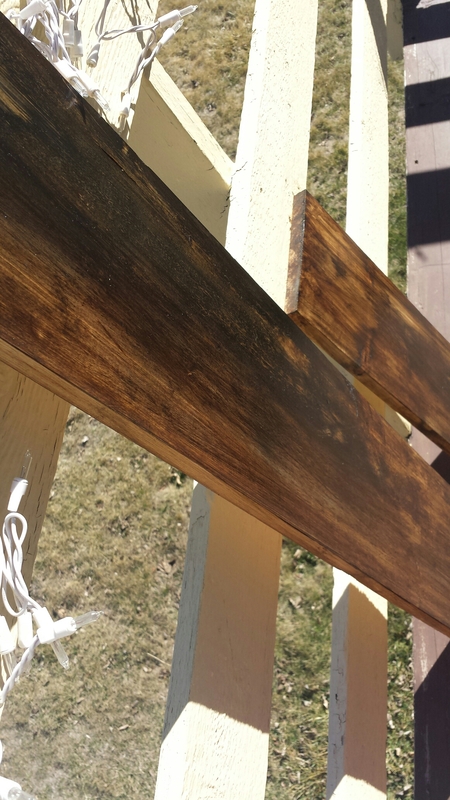 I took card board outside, unscrewed all the switch plates from the wall, took them outside and lightly sprayed them. It took several passes from different angles, but I didn’t want to spray too much. 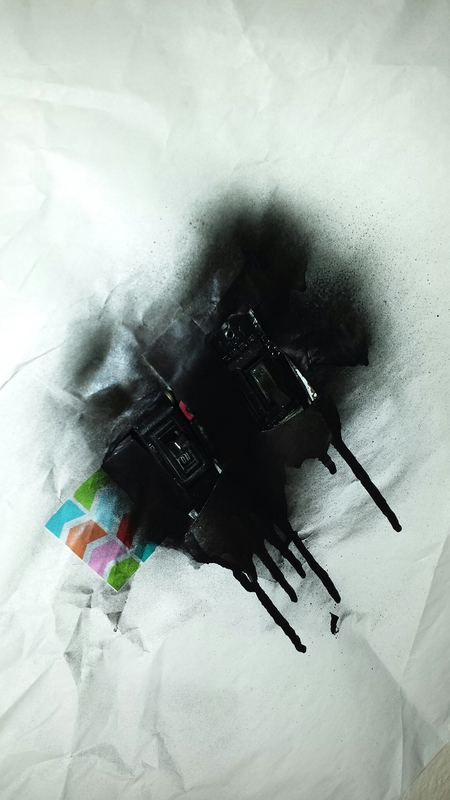 While those were drying, I covered the wall around the switch with a large piece of craft paper and cut out a hole small enough around the switch to protect the wall… but paint the switch. Again, lightly spray. Let dry. Flip the switch the other way and spray. Let dry. I am so impatient letting paint dry. Seriously. I can’t not touch it. 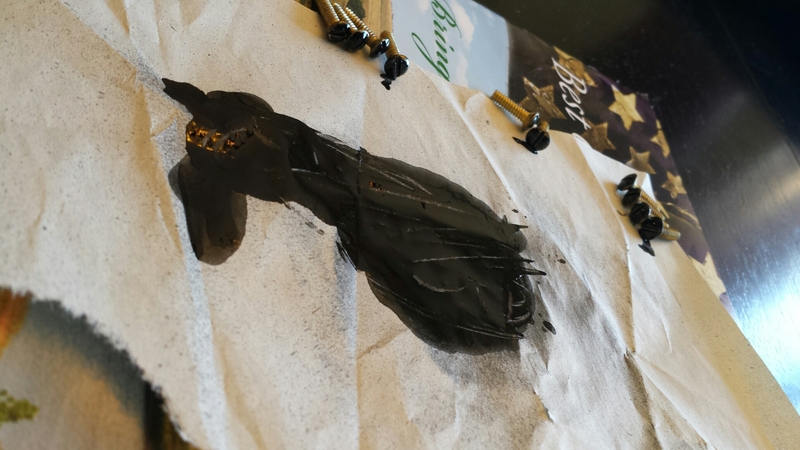 So to distract myself I sprayed a small puddle of paint on a piece of paper and dipped the tops of the screws in the paint and then set them aside to dry. 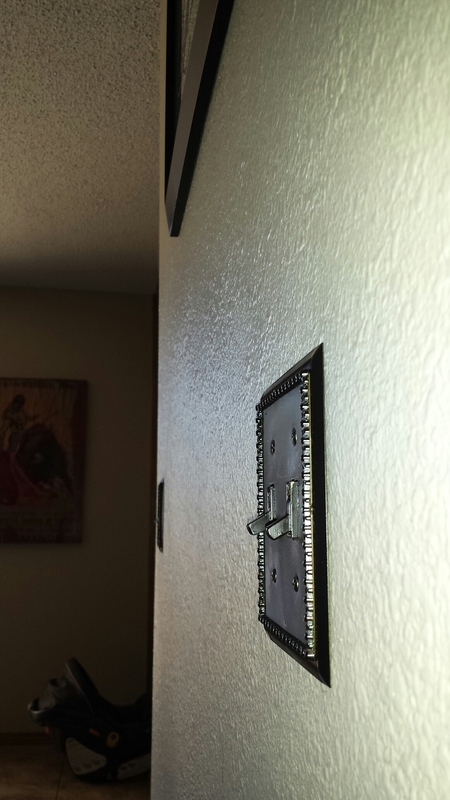 Once all is dry, take down the the paper from the wall, gather the switch plates, and screws and assemble! BAM! Instant upgrade! 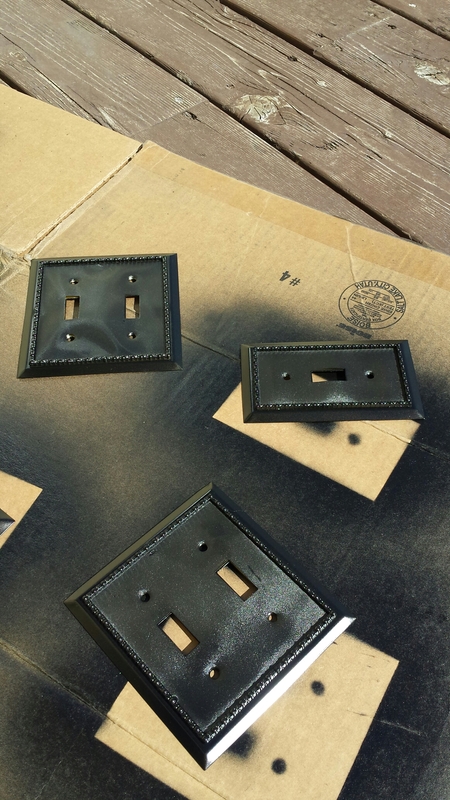 One can of spray paint instead of $5+each (for 4 total) new switch plates. Plus, I still have lots of paint left over. What to paint next? In Bismarck, companies started holding “Pinterest” nights where you get together with friends and do a prepared craft. Super fun, right? One night we were doing wreaths. 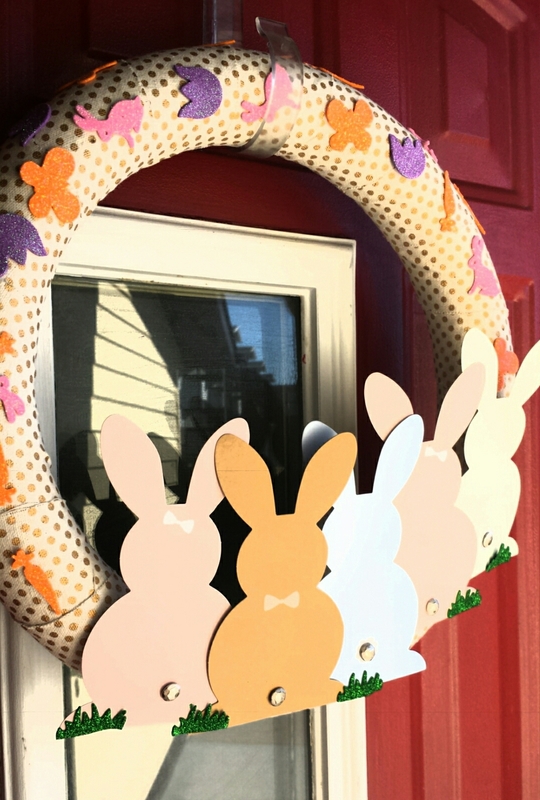 I love this because I ended up combining a couple pins into a wreath I can use year round. The best part is that my son and I do it together. We with make or buy the decor to go on our wreath. We’ve even gotten Hubby’s expertise involved! Check it out! 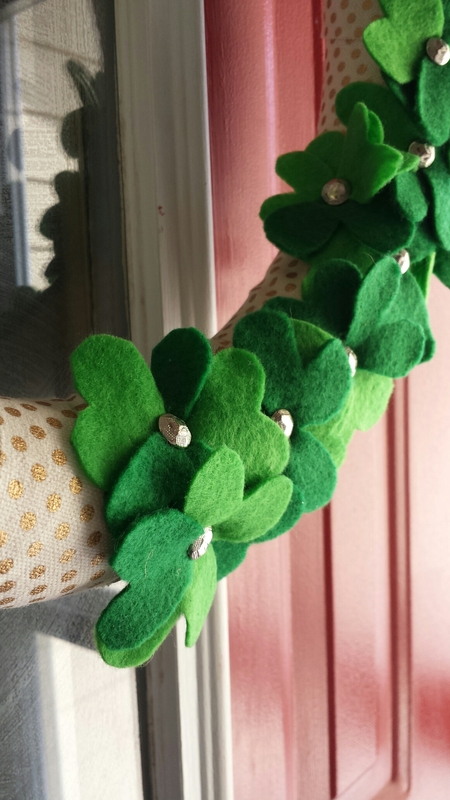 This is my St. Patrick’s day wreath. Felt hearts held together with beautiful nail heads and an origami bow! 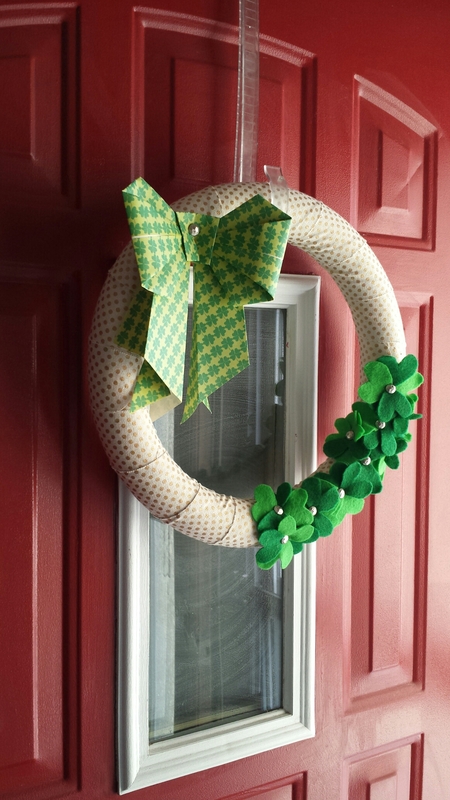 For the base wreath, I started with a green foam floral circle you can pick up at any craft store but I’ve seen them at Walmart and Target too. Then pick a neutral ribbon to tightly wrap around it. 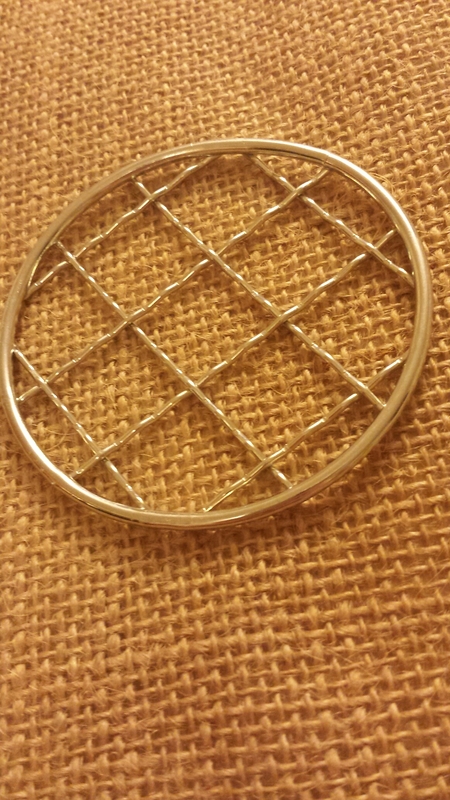 This one is a canvas ribbon. 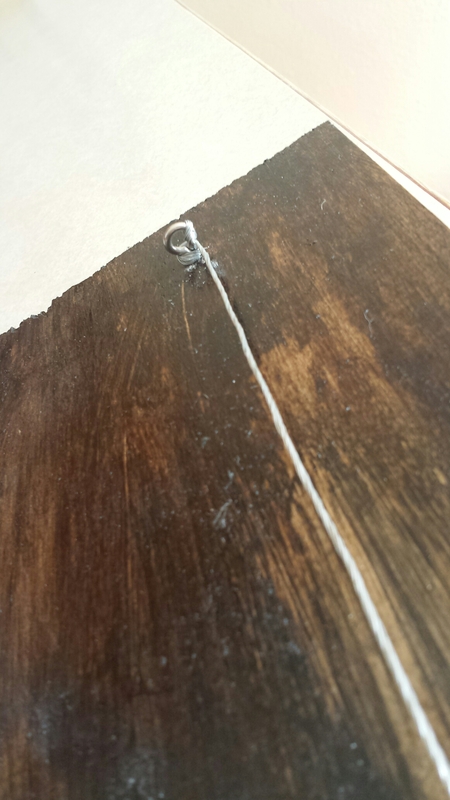 I think it’s better not to use ribbon with wire and definitely use something wide. Just wrap around tightly and secure with pins. Easy peasy. You’ll want to wrap at a bit of an angle to keep it flat. After that, it’s a free for all! 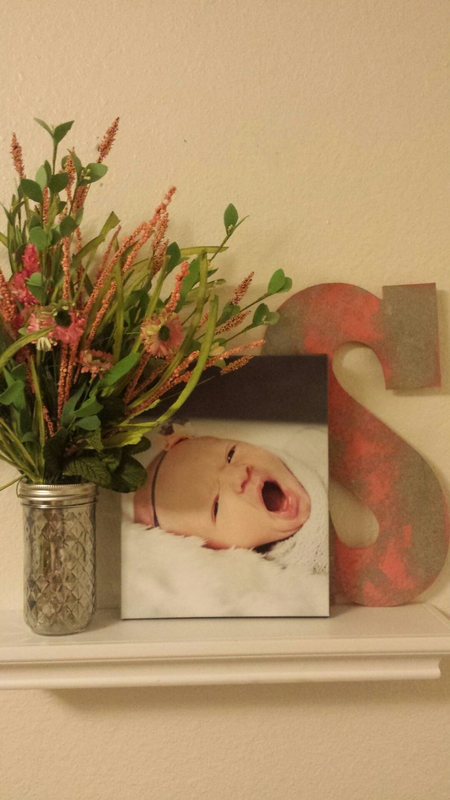 I’ve gone from a wreath once or twice a year to all the time with a quick switch of decor. 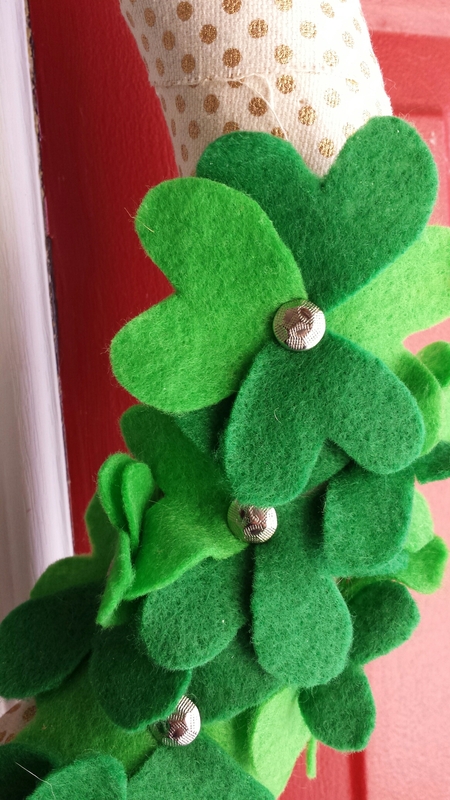 This one we simply cut out small heart shapes from green felt and grouped them into fours and held it together with a nail head to make out four leaf clovers. The origami bow was a pin I found from How About Orange, complete with instructions. My husband loves to do origami so I knew this would be an easy request. After a practice bow I got this perfect finished product and pinned it on. I had him make me one for Easter, since it’s right around the corner, and 4th of July since I was on a roll! The possibilities are endless. We’ve cut shapes from felt, bought the foam cutouts from the store. Last easter we added eggs from Joann’s that Danny and I found. Sometimes I do a ribbon bow or no bow! 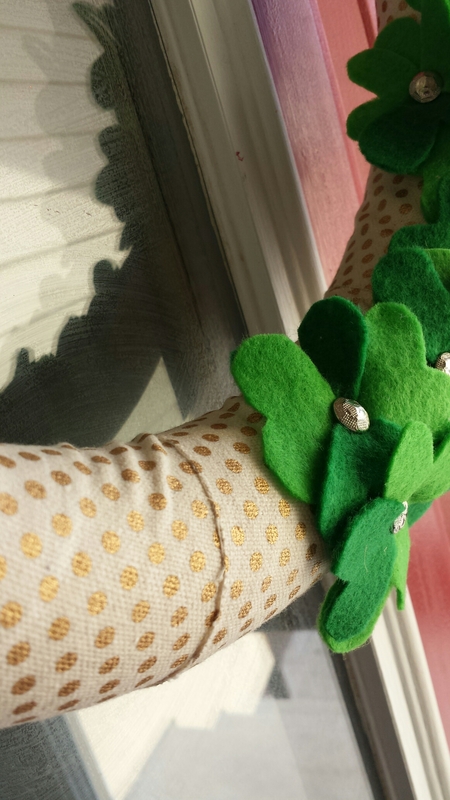 You can also check out The Crafty Mummy for a great felt flower tutorial! 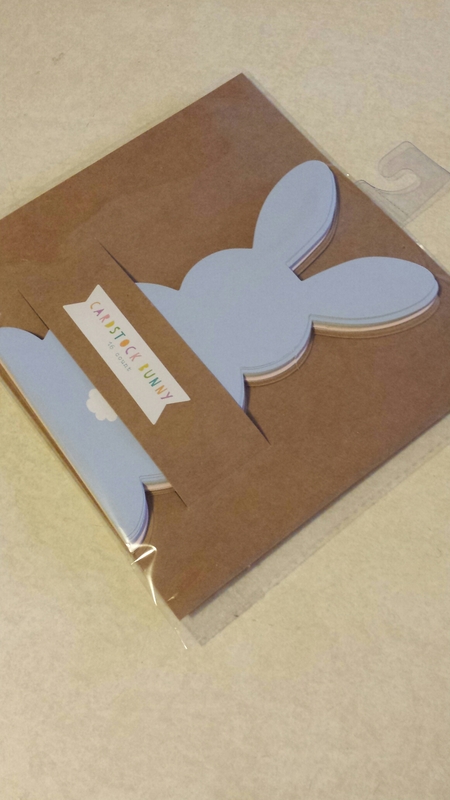 Today we found rabbit cutouts in the Target dollar section so we are ready to make our next holiday wreath! I’ll post more as we decorate for the holidays and seasons! 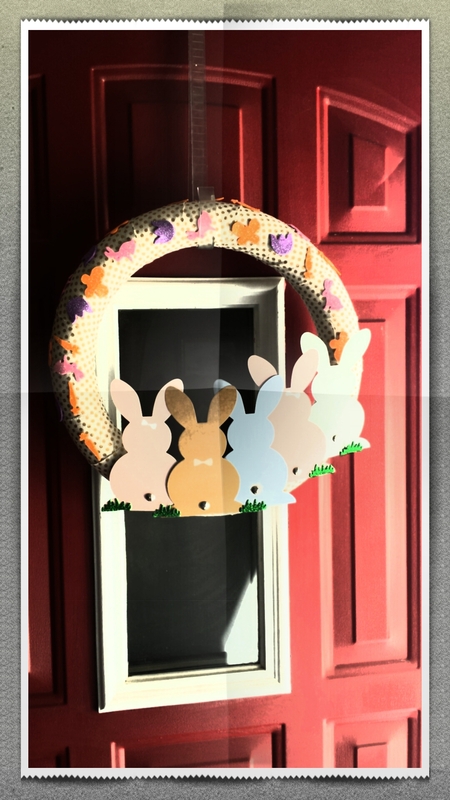 Here is our Easter wreath! My son was so proud of his creation. This I created for my daughter’s birthday, her Purple Princess Party. Full instructions for the wreath HERE. The 4th of July is headed our way, so we took advantage of the roses on the Derby wreath and carried it over on our red, white, & blue wreath! Felt cut into strips (held on with straight pins) and felt star stickers is all you need for this patriotic wreath. This is my latest obsession. I have been in love with a vintage style forever. 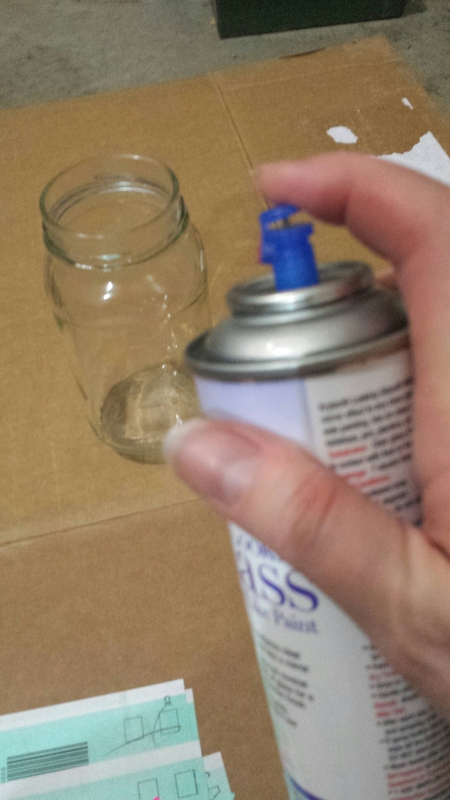 And I found a pin from being Rachy where she spray painted glass jars giving them a reflective finish. I tried it once, loved it, then went around the house looking for more to paint! 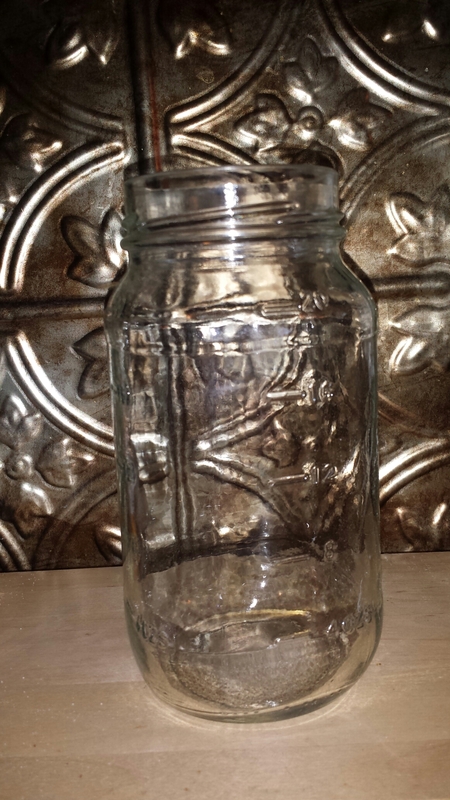 Because we use mason jars as our drinking glasses, (I upcycle our pasta jars!) I always have plenty on hand for any craft. 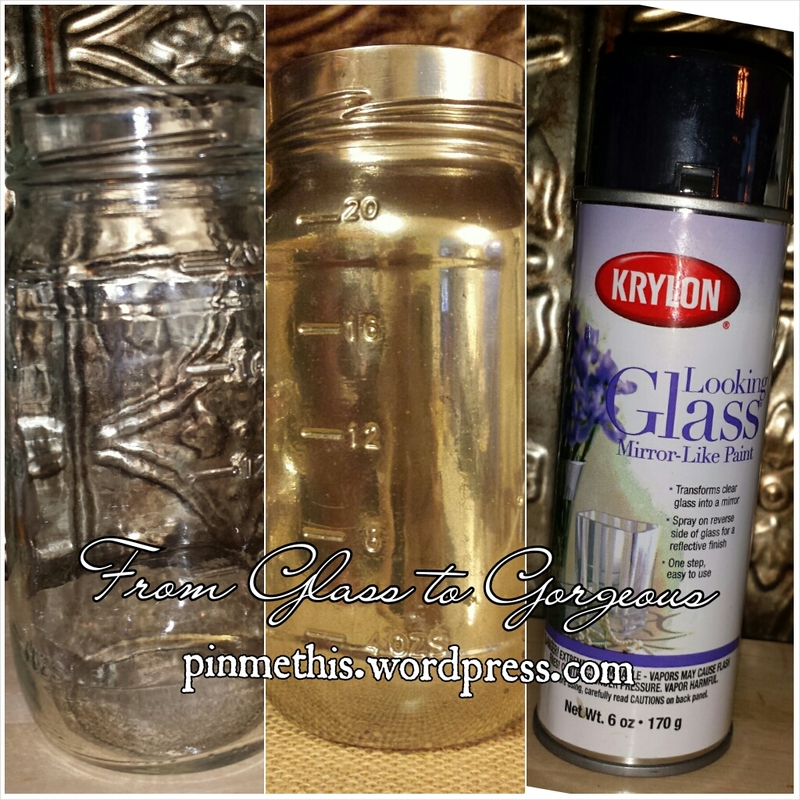 All you need is anything glass, a vase, a bowl, a Mason jar, whatever your heart desires and a can of Krylon’s Looking Glass spray. In a well ventilated area, place your glass item on a protected surface. Spray lightly and in passes so you don’t get too much on it and it starts to drip. If you do get a drip, like above, just quickly wipe it off with a paper towel. The faster the better. I like to rotate the glass as I spray to keep it even. 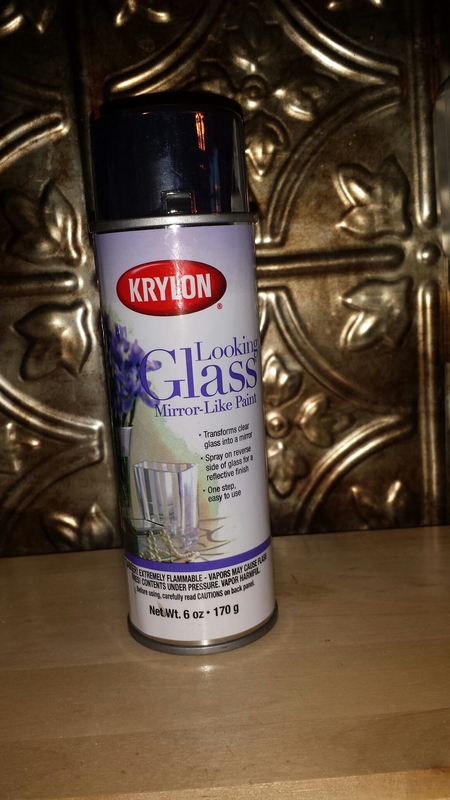 The best part of this spray is that if it’s not perfect or even or a little blotchy, it can still look great. 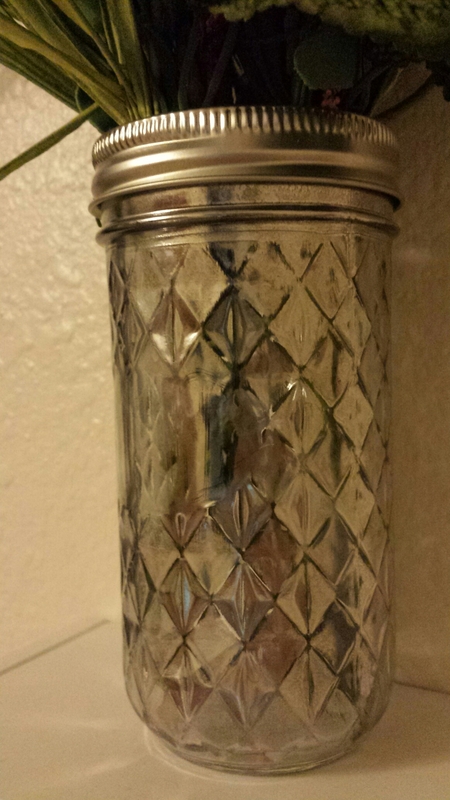 My latest project I wanted to spray a quilted jar to hold flowers for my daughter’s room. 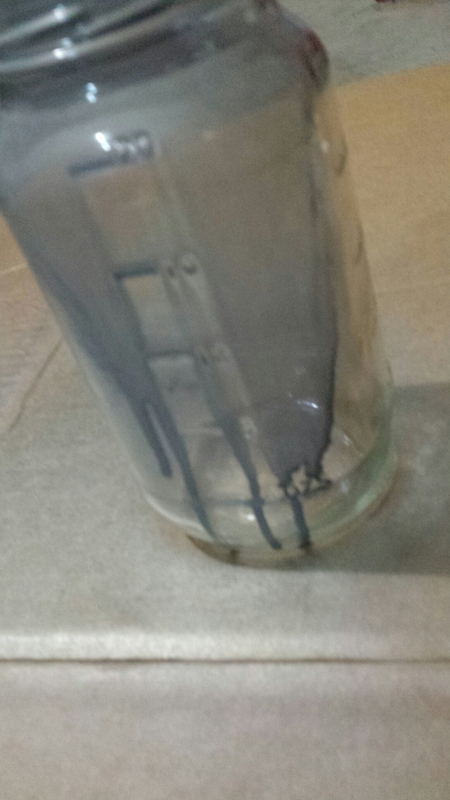 Once I sprayed it, I took a small piece of sand paper and lightly went over the jar to give it a more imperfect, vintage feel. *Here is a bonus*! 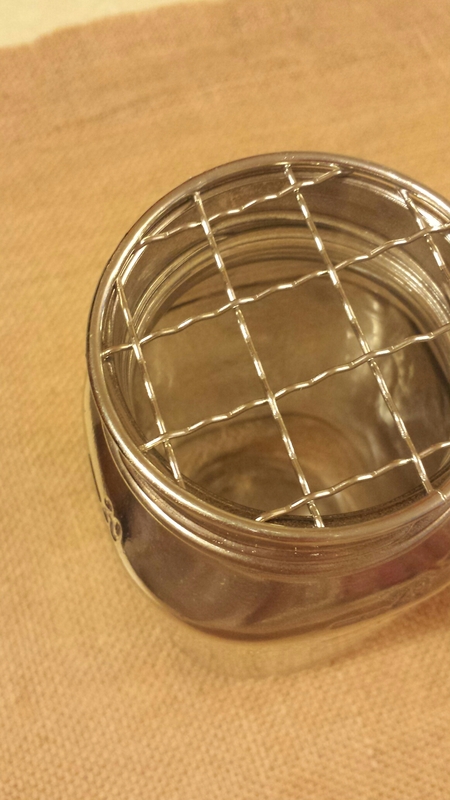 I found these great additions, at Hobby Lobby, to jar lids to help separate the flowers. They just fit right on top under the lid. Love the elegance of this look and is so easy! What will you paint? For other fun with glass crafts click here!